This summer during S.E.A. Camp, the Fulton Mansion State Historic Site became the scene of a crime when the Fultons’ cookies went missing from their cookie jar! Summer Experience in Aransas (S.E.A) Camp is a partnership between the Texas Maritime Museum, Fulton Mansion, Texas Parks and Wildlife Coastal Fisheries, Goose Island State Park, and the Bay Education Center. The partners provide an opportunity for 176 local kids in first to fifth grades to visit the local attractions during June and July. At the mansion, S.E.A campers got to play detective as they visited six mystery-themed stations to solve riddles, collect clues, and create a secret message decoder craft to solve a mystery message left by the cookie thief. Upon arrival, each camper received an evidence bag and magnifying glass that was theirs to keep. In the first station, campers tested their physical skills with games like the sack race and three-legged race. In the garden station, campers used a scavenger hunt sheet, their magnifying glass, and their five senses to explore the mansion’s garden and search for clues. In three stations (the first floor, second floor, and basement of the mansion), scavenger-hunt style riddles guided campers as they went room-to-room finding clues like mustache erasers. 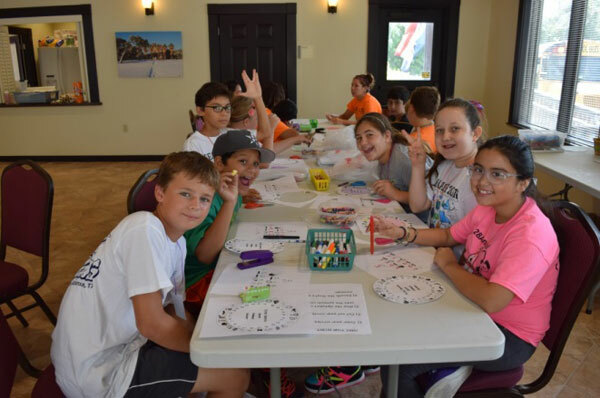 Finally, campers created a secret message decoder and used it to match the clues they found to solve the secret message. The fifth graders, graduating from their final year of S.E.A. Camp, got a real treat when they visited the mansion’s third floor rooms and the dining room butler’s pantry, all of which are normally closed to the public. Be sure to learn more about upcoming events at the Fulton Mansion and like the Fulton Mansion Facebook page. 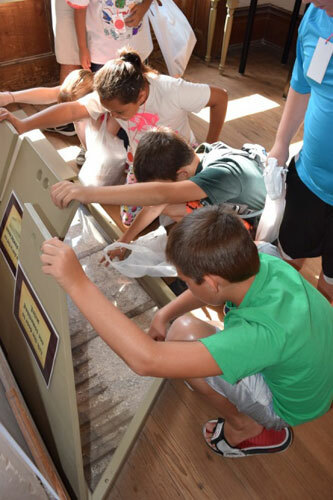 Campers also enjoyed learning about the mansion’s unique construction.